Beth Faiman discusses the difficulty of keeping abreast of all the new multiple myeloma treatments and how she personally stays up to date on all of the information. Beth Faiman gets questions from her patients about daratumumab on an almost daily basis. Find out what their most asked questions are. Patients with newly diagnosed multiple myeloma have different needs than pateints relapsed/refractory disease, and Beth Faiman addresses what some of these needs are. 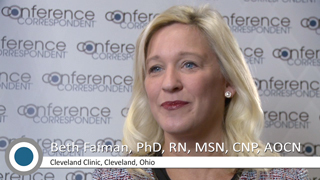 Beth Faiman discusses why it's important to communicate with and educate patients so that they can better manage their symptoms before they become more severe. Beth Faiman expresses her main concerns regarding new treatments being studied to treat multiple myeloma.